Great to see that the UK takes the Eurovision seriously again! 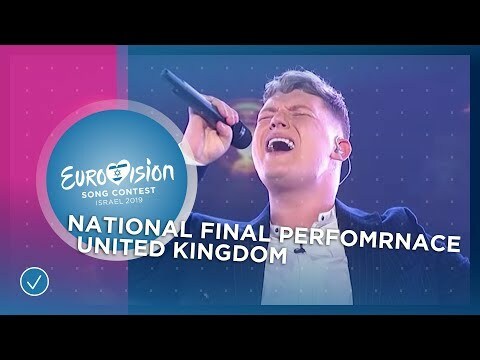 There was another national final “Eurovision 2019: You Decide”. This time there were six participants and three songs in two different versions. At the end Michael Rice could receive the highest amount of votes with “Bigger Than Us”. The young singer Michael Rice was born in Hartlepool, close to Newcastle upon Tyne in 1997, the year when the UK won last with “Love Shine A Light” by Katrina & The Waves. When Michael was young, he started as a street musician. In 2014 he took part in the X Factor and 2018 he could win the “All Together Now” show. This year Michael could win the national final of the UK and will represent his country in Tel Aviv. A funny coincidence: one of the composers of “Bigger Than Us” is the Swede John Lundvik. The same guy who has won the Swedish national final. So John Lundvik will be the only person with two entries in this year’s ESC. The UK entry “Bigger Than Us” is a powerful ballad with a memorable chorus. Of course, it’s a love song. The song itself is nothing special, but the way Michael is presenting it, full of energy make it special. With a good stage performance this could do well. The English speaking countries always enjoyed the language advantage for a long time. Since the language rule has been eased for every country, the United Kingdom, Ireland and Malta have suffered a lot, all countries were able to sing in English or any language of their choice. Additionally the general interest has been impacted as well, which is mainly due to the funny, sarcastic and snappy comments of the BBC commentator Terry Wogan, who unfortunately passed away at the end of January 2016. There was less good will and appreciation, unfortunately the music of the ESC has been put in the trash corner with the consequence that this music event is not being taken seriously anymore. With the effect that established singers and composers make a wide berth around the ESC. Even if the BBC has send Blue, Engelbert Humperdinck and Bonnie Tyler as “old weapons” into the contest, it did not bring back the old glamourous times. It seems those singers have only been taken part for reactivating their careers. There are so many talented singers and composers in the UK, those should be motivated and encouraged instead. The time has passed when UK entries were successful song which also topped the European charts.